Goma Protect provides the various sizes of gabion Box with or without pvc coating as per clients' requirements. It is a Double Twisted Hexagonal GI Wire with PVC coating container of variable sizes, uniformly partitioned into internal cells, inter-connected with other similar units, and filled with stone at the project site to form flexible, permeable monolithic structures. In line with variegated industrial requirements of our prestigious clients, we are offering an innovative array of Stone Gabions. 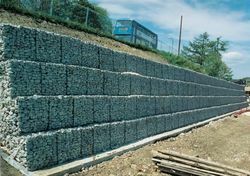 These gabions are used in many situations including the stabilization of earthy movements, canal refurbishment & landscaping. Offered gabions are thoroughly tested on appropriate quality parameters for make certain its excellence at our end. 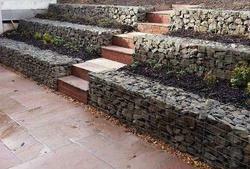 The provided gabions are available at nominal price from us. 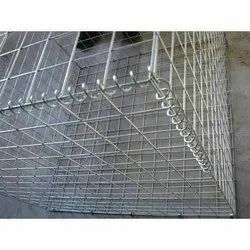 With our spacious experience and immense knowledge, we are widely engaged in supplying a wide array of Welded Wire Gabion. The product offered by us is manufactured using high grade raw material and ultra-modern techniques. Our offered range is widely used at various industrial as well as non-industrial areas to avoid unwanted intruders. Furthermore, our valuable clients can avail this product as affordable price from us.